The Chancellor has claimed that every household would be £4,300 worse off outside the EU – but the Treasury’s calculations are based on a false premise the value of the Single Market to British trade. 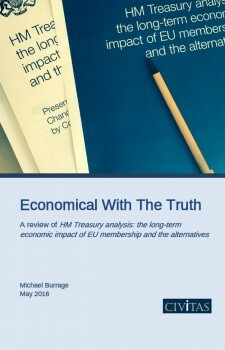 In this report, Michael Burrage interrogates the assumptions underpinning HM Treasury analysis: the long-term economic impact of EU membership and the alternatives and finds that they ignore much of the published evidence about trade growth over recent decades. Specifically, the Treasury suggests that EU membership has increased UK trade by 68-85% compared to what it would have been if Britain traded merely under WTO rules. The EEA relationship that Norway and Iceland has with the EU is said by the Treasury to have raised trade by 35-53% and bilateral agreements, like that of Switzerland, by 14-21%. However, OECD and IMF figures shows that those nations who are not a member of the EU – and have traded with it under WTO rules – have consistently experienced stronger export growth to the Single Market since its inception in January 1993 than either the rest of the EU or Norway, Iceland or Switzerland. Britain’s rate of export growth to the EU has been lower still. His findings suggest that access to the Single Market as a member, far from being a benefit that must be preserved at any cost, has not proved advantageous in terms of the growth of UK goods exports, and that trading under WTO rules has not been a handicap. ‘The compound annual growth rate of the exports of the UK and other EU members to each other has been lower than that of all the other countries who export to them, whatever their trading relationship with the EU might be, despite the benefits and protection provided for its members by the EU‘s tariff and non-tariff barriers,’ Burrage writes. ‘HMT spends a great deal of time describing these barriers to warn of the fate that awaits the UK if they were to join the EEA, or the countries with bilateral agreements, or those who trade under WTO rules without any kind of negotiated agreement. Michael Burrage is a director of Cimigo, which is based in Ho Chi Minh City, Vietnam, and conducts market and corporate strategy research in China, India and 12 countries in the Asia Pacific region. He is also a founder director of a start-up specialist telecom company which provides the free telephone interpreter service for aid workers and others where interpreters are scarce. He is a sociologist by training, was a Fulbright scholar at the University of Pennsylvania, has been a lecturer at the London School of Economics and at the Institute of United States Studies, specialising in the comparative analysis of industrial enterprise and professional institutions. He has been a research fellow at Harvard, at the Swedish Collegium of Advanced Study, Uppsala, at the Free University of Berlin, and at the Center for Higher Education Studies and the Institute of Government of the University of California, Berkeley. He has also been British Council lecturer at the University of Pernambuco, Recife, Brazil, and on several occasions a visiting professor in Japan, at the universities of Kyoto, Hokkaido and Kansai and at Hosei University in Tokyo. His previous Civitas publications include The Eurosceptic‘s Handbook (2016), Myth and Paradox of the Single Market (2016) and Where‘s the Insider Advantage? (2014).